Did you know that you can buy a home with ZERO down payment?? If a home purchase is your goal this year but you aren’t able to save up enough of a down payment, you may qualify for a low or zero down payment mortgage. One of our Lenders is offering a great zero down program. What is a Flex-Down Mortgage? A Flex-Down Mortgage is a mortgage product that has a flexible down payment amount. There is still a down-payment required, but it will vary based on the property value. -For a property valued at greater than $500,000 and less than $1 million –5% down payment is required up to $500,000 with an additional 10% down payment on the portion of the home value above $500,000. Flex-down mortgages can only be on first mortgages, not second or third or used in refinance situations. As noted above, the total property value has to be less than $1 million. This type of mortgage will also have insurance included with it—the premium will be lesser of the premium as a % of the total new loan amount or the premium as a % of the top-up portion additional loan based on the rates at that time. Those considering this type of mortgage are recommended to have very little debt and be able to accommodate the additional cost of higher mortgage insurance (due to the higher risk to the lender on this type of mortgage). Typically, the insurance premium would be 0.2% higher on a flex down mortgage. You can borrow your 5% payment from a Line of Credit or even a credit card. This can then be used for your down payment. You have to disclose this to the Insurer and it will be on the application that goes to the Lender. This is perfect for someone just getting into a new high paying job or for someone who is renting and can afford higher monthly payments but would take forever to save up the 5% down payment. This type of mortgage product can be an excellent option if you don’t quite have enough for the down payment. Are you interested in learning more about this mortgage product? Contact The Angela Calla Mortgage Team to show you how a Flex mortgage can make the home of your dreams happen sooner than you think! Consider this: Just because you have home insurance doesn’t mean you’re covered in the event of a flood or earthquake. Depending on where you live, you may need to purchase additional coverage to be protected from a natural disaster. It’s best to talk to your insurance provider to make sure you’ve got the coverage you need. When we tie the knot with our soulmate, we assume it’s going to be forever. It’s pretty much written in the vows. Unfortunately not all marriages have fairytale endings. In fact, a very significant amount of marriages in Canada end in divorce. The most recent data suggests 38 per cent of all marriages in Canada don’t last until death. The average marriage lasts 14 years, with 42 per cent of divorces occurring in marriages lasting between 10 and 24 years. What we do know is, divorces can get ugly and be costly for both individuals involved. And if the marriage is years old, there’s likely a home or property that gets caught in the middle. A typical divorce scenario sees that when the couple breaks up, the matrimonial home is sold and what’s left over is split. In almost all cases, even when one party wants to keep the home, the lawyers, the banks and the professionals always suggest selling the home. It makes sense, since most couples get a mortgage they can afford together, not on their own. But if the home is full of memories, or children are involved, it can be an extremely painful situation. There is a unique alternative very few professionals even know exists. All three of Canada’s mortgage insurance providers, Canada Mortgage and Housing Corporation, Genworth Financial and Canada Guaranty, offer what’s called a spousal buyout program. The program is considered a purchase, so all the requirements and qualifications needed in a traditional mortgage still apply. In this case, you’ll also need a purchase agreement and a separation agreement with all the debts and payments spelled out. The spousal buyout program is a one-time opportunity. It can be used to pay off other debts outside the separation agreement, but it depends on which one of the three insurers you use. Even with a helpful loan-to-value ratio, some people still can’t afford to take on the home on their own. The program also allows people to bring on a cosigner, often a new partner or family member. At the end of the day, divorce is unfortunate. The programs allows you to keep your home and your kids can stay where they’ve grown up. And that makes the situation at least somewhat more bearable. 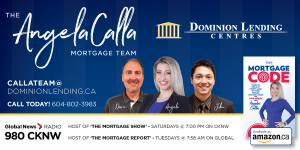 If you do find yourself in a divorce and you’re not sure what to do about your home, contact The Angela Calla Mortgage Team before making any decisions. We can help you! The best mortgage plan is one that is developed by assessing your goals and life stage. 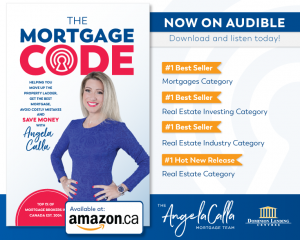 The Angela Calla Mortgage Team will help you personally. 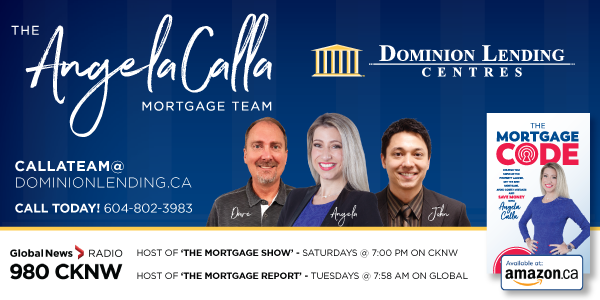 Call us at 604-802-3983 or email callateam@dominionlending.ca. Homebuyers are starting to see relief and the pendulum swing their way for the first time in years. It’s no surprise, as we’ve have had a collision of circumstances that have both slowed the local real estate market and dropped prices down as much as 30 per cent. We have the stress test forcing borrowers to qualify at two per cent higher, a speculation tax in B.C. and raised interest rates from record lows. We had a seller’s market with less than four months of supply on the market, then four to six months of a balanced market and now a buyer’s market, where we have over nine months of product on the market. With all of the supply available, sellers are having to set their price below the last sale if they are serious about selling. On March 19, we will see if there will be any changes in the federal budget. There have been rumours of a modification to the stress test by a percentage point and perhaps a 30-year mortgage option back for insured mortgages. Now with spring here and bank profits down from the normal increases due to less lending, we’ve seen a decrease in both the fixed and variable rates. Watch the numbers once the housing supply drops to four months, and remember every neighbourhood is different. If you have any questions, I’m here to help you and the people you care most about.